Click on Album to see pics. 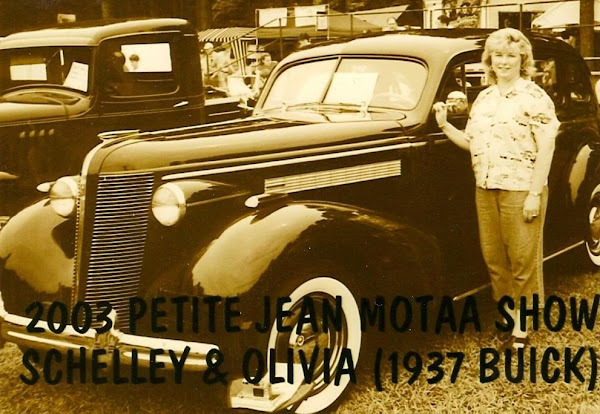 Early in my life I became attracted to antique cars and the love of riding on a motorcycle. Of course not just any motorcycle would do. It had to be a Harley. I was 15 years old the first time I jumped on the back of a Harley with a complete stranger! I can still see the looks on my shocked friend’s faces as I jumped on the back of that bike and roared off. I am sure they thought they would never see me again. It later became part of my dating criteria which was probably not such a good choice for picking men! If they didn’t have a Harley I usually passed them by unless they had a Corvette. Both of these modes of transportation can be equally exciting, especially when you are young and think you are bulletproof. This past August I got to take the ultimate motorcycle vacation with a group of my best friends. We were Sturgis, South Dakota bound for the biggest gathering of motorcycle enthusiast in North America. This was the 69th year for the world famous rally. I know you are thinking wild, lewd behavior and bar room brawls. Not true, at least not where I was! Sure…if you get that many folks together, you are going to see a little bit of everyyyytttthing and sometimes a lot more skin that you would like to see! 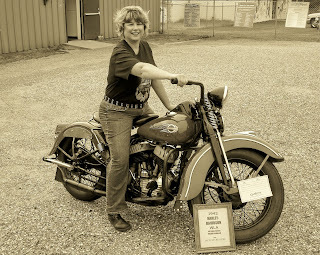 For the most part Sturgis is normal folks that love to ride, love the smell of leather and fresh air mixed together all from the seat of a great bike. We saw and rode through some of the most beautiful parts of the U.S.A. that our country offers. I have never been in this part of the world before but look forward to going back. The weather was perfect for riding. Morning temperatures of 40s and highs in the mid 80s by afternoon made this trip a piece of heaven for Louisiana folks. A few afternoon storms were on hand but passed over quickly and made the nights great. Fortunately we missed the terrible hail storm that took place on the Friday we left. This storm did thousands of dollars worth of damage and the videos made it to “You Tube”. We also missed Steven Tyler of Aerosmith falling off the stage but our friends got to see that. Four from our crew stayed at the legendary Buffalo Chip campground; we never made it to the Chip during our trip. For those looking for a little more action the Chip is definitely the place to go. Anything goes at the Chip! To get there from here it is a two day hard drive. I now know where corn comes from. Corn is all you see for 1000 miles. Yes we trailered the bikes; it is way too far for ME to ride. I wanted to get there ASAP and then ride. Our first problem happened when we pulled up to where we were staying on Saturday afternoon. We got out of the truck and smelled anti-freeze. The water pump on the truck had gone out. Thanks to Joan and Ron, the great folks that owned the home where we stayed, three or four hours later we had that fixed so we could concentrate on the rest of the week and all the rides and fun that were in store for us. Our week of fun started on Sunday with a trip to Mount Rushmore. If you have never seen this iconic part of America you have to make this trip. To see it from the back of a Harley probably makes it even more impressive. It was simply one of the most awesome sights I had ever seen. I didn’t know that the rest of the week would be equally as beautiful, plus viewing these amazing sights with hundreds of other bikers made it even better. 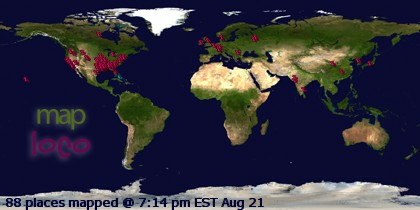 I quickly learned that many of the people that go to Sturgis every year come from overseas. Many of these riders ship their bikes over for the rally; we met and saw folks from Germany, Scotland, England, and all parts in between! We estimated that in a 100 mile radius a million folks were in for the rally. What an economic impact for this area! The amount of money spent is probably averaged out around $1000 per person and that is probably on the low side. The B & B we stayed at in Rapid City prepared some of the best breakfasts we had ever had. We ate so much for breakfast we didn’t need much else the rest of the day. Other than breakfast, one of our favorite meals for the week was the buffalo burgers that were at many of the restaurants. Our favorite place we dined was at Kevin Costner’s place in Deadwood. Costner’s movie props and costumes fill the walls and make this a great dining experience. Costner’s “Dances with Wolves” was filmed locally and you can tour the movie location. We hoped to see live buffalo when we rode in Custer State Park but we didn’t see any, except for one in a field when we passed through Oklahoma. Our next day was supposed to be a ride with the whole group. But that was not to be. One of the bikes had a problem out on the road. This problem created what I refer to as a “roadside seminar”. Even with all the knowledge by our men-folk of what makes a Harley run, the breakdown caused part of our group to change their plans and get in gear to get this bike back on the road. 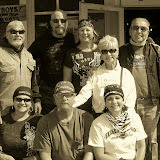 After a day in the Rapid City Harley shop they were finally back in the saddle again but not until the following day. Yes they do break down and from the looks of the repair department they were slammed with some anxious folk’s bikes. You can always rent a bike if you can’t get yours fixed and quite a few were just buying a new one! They say H-D stands for hundred dollars! I thought that was what would happen within our group. We had one member with a hole burning in his pocket for a custom Chopper. Sturgis is filled with vendors and bike builders from across the country. You can spend lots of money very easily, if you have it to spend! Our next week was filled with wonderful rides to Custer State park, Devil’s Tower in Wyoming, Needles Highway, Crazy Horse monument, Boot Hill Cemetery, the Badlands and all parts in between. These roads and highways seem to be made just for motorcycles. As we made our way through the beautiful canyons and mountains, the rumble of loud pipes was music to my ears as the miles and miles of riders stretched on in front, behind and coming toward us for as far as you could see. I have never seen so many motorcycles in one place in my life. It made you smile just to know that you were part of something that big. At the Rapid City Convention Center, the Harley-Davidson Expo was the place to see all the 2010 models, motors and clothing. I even learned I had made it in the 2010 brochure. I picked up the new brochure and turned the page and instantly saw my picture. 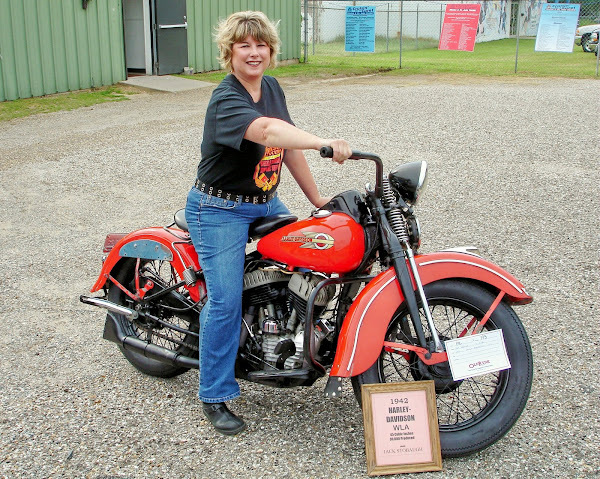 It is a picture of me sitting on a good friend’s 1942 Harley, in the mosaic that makes up this years book. I was so excited to think that out of millions of pictures submitted that I was picked. Yes it is a very tiny photo but it is still a part of the overall picture. www.harley-davidson-mosaic.com and for key word search type in Minden. In fact I have found it in about 5 or 6 places so far! As I have matured (I hate that word) somewhat (I turn 50 this year) I started thinking I need to learn to ride my own Harley. 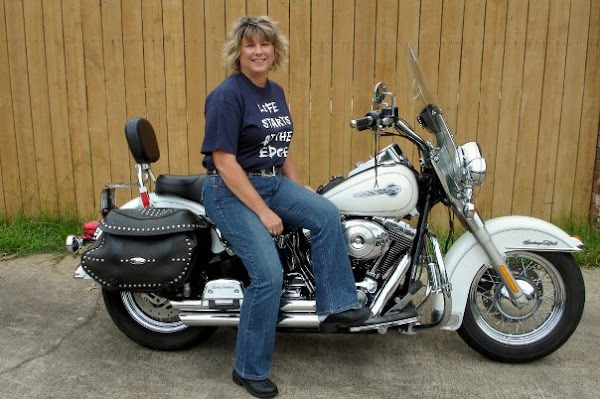 Women riders are on the rise and Harley-Davidson designs many of the bikes with women in mind. 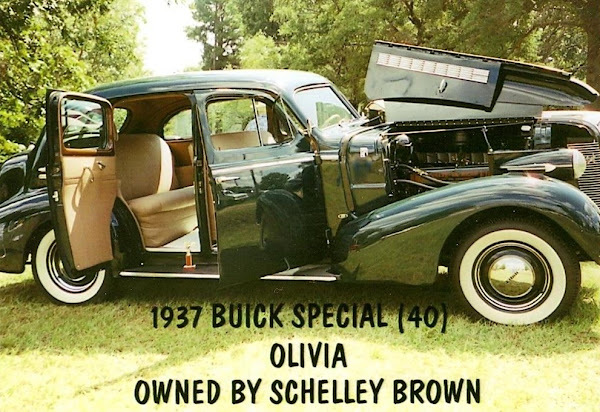 In August before I left for Sturgis, I sold my beloved 1937 Buick “Olivia”. She needed to be passed on to a family that would love her as much as I have loved her. She had served her purpose and had changed my life for the better. She is now helping me with a new part of my life. 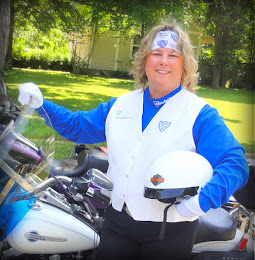 Selling her will allow me to possibly do something else that I have always wanted to do…so in August I signed up for the Rider’s Edge riding class at the Shreveport Harley store. They say life begins at 50; my class is one day after my 50th birthday. 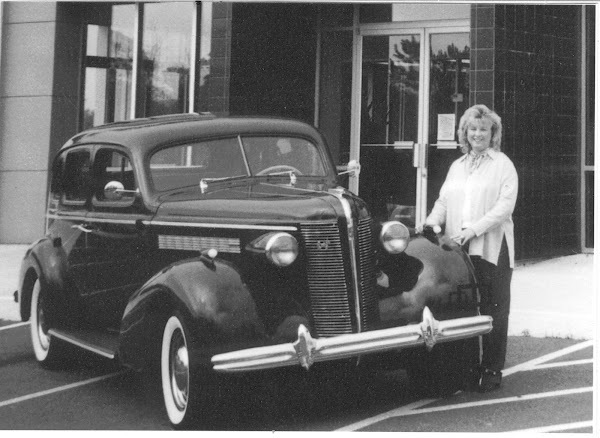 I have my eye on a Deluxe with wide whitewalls and two-tone paint that resembles the old 1940s bikes. For anyone wanting to get rich quick now would be the time to take out a life insurance policy on me! So for now I will try to keep the shinny side up and the rubber on the road!